U.S. Speaker of the House Rep. John Boehner (R-OH) walks to the House Chamber for a vote October 3, 2013 on Capitol Hill in Washington, D.C. Welcome to Day 4 of the ongoing federal shutdown. Still no signs of progress or anything to suggest that there won’t be a Day 5, or 6, or 7, or … John Dickerson, Dave Weigel, Matt Yglesias, and the rest of Slate will continue to bring you in-depth analysis from Washington. But below you’ll find a running list of today’s smaller developments, rumors, links, and theories floating around inside the Beltway and out of it. Senate Democrats and Mr. Obama are standing firm against any measure that links further financing of the government to a blow against the Affordable Care Act, and they are opposing Republican efforts to relieve the pressure by reopening politically sensitive or visible government functions. The mixed messages from Republican leaders may be aiding the Democrats’ cause. In one breath Friday, Mr. Boehner said the confrontation boiled down to two very different issues: the health care law and the deficit. President Barack Obama used a surprise walk out of the White House Friday to get a sandwich and the spotlight in the government shutdown as it dragged on with no negotiations scheduled with House Speaker John Boehner. Obama strolled unannounced out of the White House gate, making his way along with Vice President Joe Biden a block up Pennsylvania Avenue to a Taylor Gourmet deli that was offering a discount to furloughed federal employees going without a paycheck. “As long as they’re off the job, nobody’s winning,” Obama said as he walked up to place his order. He was responding to a reporters’ question about a quote in the Wall Street Journal from an anonymous senior administration official who reportedly said the White House was “winning” in the clash over the shutdown, and that the length of the shutdown “doesn’t really matter to us.” Obama bristled at the suggestion. House Democrats will use a parliamentary procedure to try to break a logjam over government funding and bring a “clean” continuing resolution to the floor, according to senior Democratic lawmakers and leadership aides. Reps. George Miller (D-Calif.) and Chris Van Hollen (D-Md.) will attempt to “hijack” an existing Republican bill and file a discharge petition that ripens in just seven legislative days, instead of the normal 30 days. Under the procedure that Miller and Van Hollen plan to use, they can begin gathering signatures on their discharge petition on Oct. 11, one week from today. If the Democratic pair were successful and can line up 218 supporters for their measure, then they can bring a clean funding resolution to the floor despite opposition to such a move from Speaker John Boehner (R-Ohio) and House GOP leaders. The earliest they could get a floor vote would be Oct. 14. Will it work? Probably not. The Dems have 200 votes within their own caucus, but they’d still need to convince 18 House Republicans to break ranks to reach the magic number. While 20 Republicans have suggested they generally support a clean CR, saying you’d vote for one if it were on the floor and signing a discharge petition to bring there are different enough where there’s some political wiggle room available to those moderates who wants to stay on the sidelines. 11:15 a.m.: The Whip Count For a Clean CR: The Washington Post is keeping count and finds there’s currently 20 House Republicans who’ve said they’d back one, with another four leaning that way. There’s plenty of reason to doubt that they’d actually break with their party if they had the chance, but the number is significant because it means that if you combine those 20 GOP votes with the Democrats, there would be—in theory if not in practive—more than enough support to end the government shutdown. The problem, of course, is that Speaker John Boehner would need to bring the clean bill to the floor, something he’s said he has no intention of doing. Full whip count here. How long can members of Congress hold out before they simply have to reach a deal and end the shutdown? That’s a harder question, and there’s reason to think that Congress can hold out for quite some time — a week, perhaps more. During the last shutdown in 1995-96, only a small portion of the country felt the impacts at first. It wasn’t until contractors and businesses started laying people off that the political pressure became more acute. That could take awhile. On the flip side, however, the shutdown will become increasingly painful and politically volatile as it drags on. If the impasse extends past the middle of the month, millions of paychecks will get delayed and veterans’ benefits could get disrupted. So it’s not clear Congress and the White House can hold out forever, either. Senate Majority Leader Harry Reid privately told fellow Democratic senators this week what he really thought of Speaker John Boehner. “He’s a coward,” Reid angrily said, referring to Boehner’s private push for federal health care contributions for lawmakers and their staff. 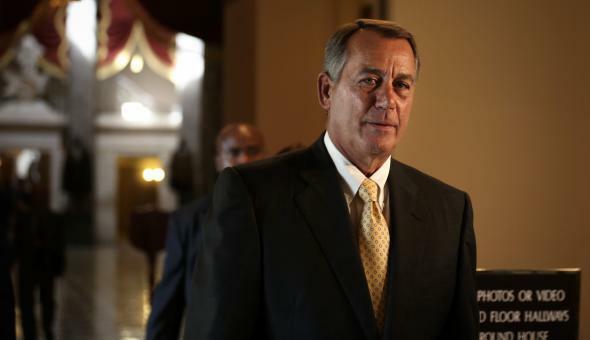 Boehner later backed legislation to end those subsidies in order to win points with House GOP conservatives. “He’s a coward!” Reid exclaimed. Boehner, Reid, Senate Minority Leader Mitch McConnell (R-Ky.) and House Minority Leader Nancy Pelosi (D-Calif.) have more than a century of congressional service between them, as well as a string of legendary political and legislative wins and losses. Yet there are times when the “Big Four,” as the party leaders are referred to on Capitol Hill, seem more like long-bickering members of a city council rather than the leaders of a great nation. Not only has the Reid-Boehner relationship sunk to a new low, but so have the once-collegial ties between Reid and McConnell. President Obama has canceled the rest of his week-long trip to Asia, pulling out of two regional summits to remain in Washington to try to break a budget impasse in Congress that has shut down the federal government, the White House announced late Thursday.